Filled with lots of illustrations of artifacts form the periods discussed for each trade along with photo copies of journals, day books from the people that where in the business. His network of researchers for being Pre computer days. Is amazing, along with his discussions of the over lap of the trades or the miss information about what the trades did. Whitesmithing is one example, today it generally is thought that it was a silversmith. From the advertising in the newspapers of the time it is clear that it was referring to polished/cleaned up iron and steel work. And he points this out with numerous examples. The books opens with 3 chapters that set the ground work for the following chapters. The story of the original blast furnace in the country,is the first one. The story of the forge being added too it is the second. And the the third is about the improvements in the casting of iron. That moved our industrial revolution forward. Chapter 5 deals with the Whitesmith, from one advert this whitesmith made doctor's instruments, trusses, trepanning instruments, tooth drawers, locck making, handles for spinning wheels and spindles. Some combined this with scissor and small knife making etc. Chapter 6 is the Farrier, at this time separate from blacksmith in most urban locations, in the more rural area's in some adverts he was listed as working for the local blacksmith as at this time the master smith was probably to busy to deal with taking care of the horses needs. Chapter 7 is the Edge Toolmaker, which for a time before the mass production of tools by machines. Did a brisk business, making shipwright's,carpenters, and axe's, adze's and draw knives. Chapter 8 is the Cutler, who for a time was making all the Household cutting and eating utensils. Along with swords and edged weapons, folding knifes, Scythe and Sickles, saws all kinds of mill grinders and sharpening or dressing of the same. Chapter 9 is the Locksmith, who was busy till the mass produced cheap locks came on to the scene, although most seemed to also do other work in the metal working line. Chapter 10 is the Gunsmith, who depending on his location may or may not of made everything that went into the guns that he produced. There is proof booth in the artifacts and adverts that they might have used more import Firing lock/trigger mechanisms for the cheap rifles, and purchased the barrels from smiths that were better at the barrel making/welding of the barrels. 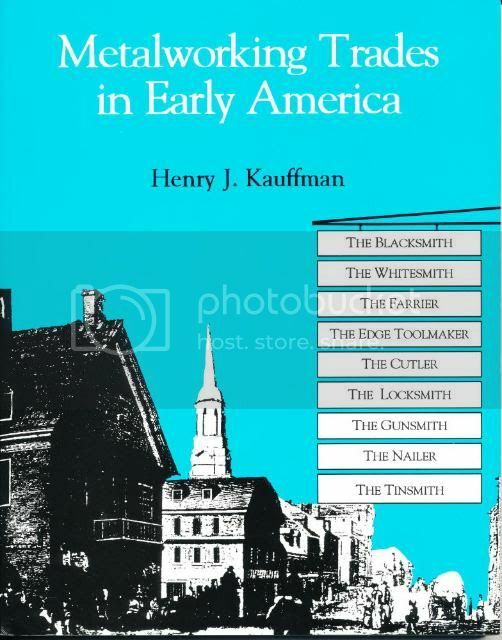 Chapter 11 is the Nailer, there are three types of people that made nails, a blacksmith that made nails when there was a lull in business, as an adjunct income producer. The blacksmith that hired a man that did nothing but make nails if there was a demand for them. Usually turned out to be a lesser skilled smith, either in smithing or business skills. And then the Farmer/Nailer to help augment the meager farming income, that had a small forge, they would get the nail rod form merchants and return nails. The children of some would make great quantities of nail during the winter. Chapter 12 is the Wheelwright, because of the iron tires on the wheels and some thing that is often attributed to a blacksmith. The fitting on the Conestoga and other wagons, was separate from the items that blacksmiths might have made in the rural and wild parts of the country. Since the number of the factories along the east side of the country, had people doing certain jobs on all of the wagons they produced, due to the demand. Chapter 13, is the Tinsmith, this is another often misunderstood trade as at the time he was working in iron sheet and iron coated with tin. Not the tin can material that many thought, as that is a more recent product. Among all kinds of buckets, and measurers, kitchen devices, doughnut, cake and cookie cutters, weather vanes, tin nursing bottles, lanterns, candle scones, oil lamps to containers to hold and store food stuffs. And the infamous pie safes, and bed and foot warmers. Part of the trouble in sorting out what and when tin items were made is that the types, styles and designs varied little from the first to the recent ones. Add to the fact little if any was decorated, or singed and dated. He finishers up with a very extensive index of the book. He doesn't include copper and brass in this survey since he has done a very exhaustive survey on those subjects.